Presenter - Brad Overnell-Carter, Assistant Head at Island Pacific Schools. The idea that students are digital natives is a myth. Like any other idea up for adoption, there is a normal distribution of interest in and ability with social media and other emerging web technologies among K12 students. To be sure, many are quite comfortable, if not always wise, users of social media such as Facebook or IM. But none of the potential educational advantages of such tools or of cloud computing are self-evident; and just as students had to be taught to see a pencil as a learning tool, they need to be taught to see the web as a learning tool. Just as we say let’s do some writing, not let’s do some penciling, we ought to focus on ends, not means, when introducing new technologies to a whole school or even a single classroom of students. This session explored the relationship to technology in general and in this light, how best to frame emerging technologies for so that students--and teachers--can see how they can use them to boost learning. Over the past year, we have developed a workflow using blogs to extend classroom discussions and encourage higher order thinking in students. Brad says: There's a lot of hullabaloo about technology these days and let me say I am a bit old-fashioned in this regard: I like Homer and Milton; I think Greek and Latin are fine things to know; and, were it not for the squeaks, I would prefer a chalkboard to my Mac. Unless technology lets me do something I couldn't otherwise do with a stick in the sand, I don't see much sense it. Despite this, Brad feels that the only way to make fair assessments of emerging web technologies and the way they are shaping how we teach is to get dirty with them. He moved the whole school over to Google Apps in the fall of 2009 and over the past year have led our staff and students in experiments with wikis, blogs, instant messaging, and web conferencing. A Stick in the Sand is where he blogs about making emerging web technologies work in grade schools. Blogging allows students to analyze and synthesize about the content they are writing. Blogging allows for students to develop their thinking rather than formal writing. This also becomes a great way to communicate to contribute later to a sychronous session. When students have the opportunity to share their thoughts it builds self-confidence as a learner. One of the driving questions in education - What happens to education (teachers and students) when information is so accessible? What should we do with this information that is found? We need to start looking at 21st century skills and have students to start help students start to be self-directed in extracting the content then analyzing and creating inquisitions to drive learning. 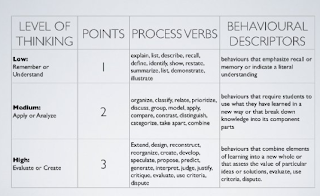 When grading blogs, here is a sample of the rubric he used for his courses. Some really great resources were shared. Here is one worth looking at, which has currently been updated and set to release in July 2010. Education for a Digital World.